This luncheon will be our annual International Dutch Oven Society meeting so we can remain in good standing with IDOS rules. You will need to be a current IDOS member to vote on any issues pertaining to the group, but all are welcome to join us and participate. The purpose of this meeting will be to set dates for future Dutch Oven Gatherings. Also we should look into donations and / or fund raisers to help cover some of the groups cost ie: pavilions and shelters. We’ve been rained on enough, so we know how important it is to plan ahead and have pavilions secured in advance. This should be a fun and productive meeting. We are looking forward to seeing everyone again in the new year. 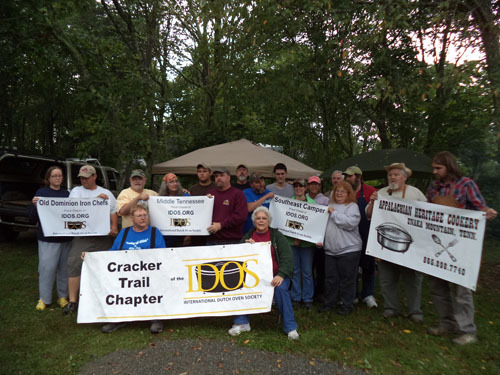 04/26/2014 – Southeast Camper “Spring” Dutch Oven Gathering at Kings Mountain State Park, SC. Please mark your calendars and RSVP us via email or leave a comment to this blog post or in the forum. We made reservations for 20 and if we exceed that, we need to let the restaurant know. Each individual will be responsible for thier own checks and tips. We had a great year in 2013. We secured Shelter #1 at Kings Mountain State Park, SC for our Southeast Camper Spring Dutch Oven Gathering 2014. We are also planning a luncheon / IDOS meeting in February to plan more Dutch Oven Gatherings and a Camping Dutch Oven Gathering for the new year.